Work being done to increase retention and narrow the equity gap in the College of Engineering and Engineering Technology at NIU is gaining worldwide attention. Associate Professor Shanthi Muthuswamy teaching students in NIU’s College of Engineering and Engineering Technology. 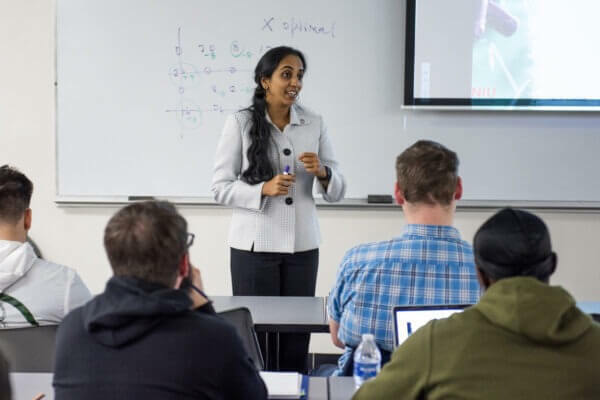 A three-pronged strategy developed by Shanthi Muthuswamy, associate professor of engineering technology, recently earned recognition through an Airbus GEDC (Global Engineering Deans Council) Diversity Award program. NIU advanced as a top 10 finalist competing with projects from various countries across the globe. “We are proud of Dr. Muthuswamy’s recognition as the top ten finalist internationally for the 2018 Airbus GEDC Diversity award, and it is a recognition not only for her but also for the college and NIU’s commitment to diversity,” said Murali Krishnamurthi, vice provost for faculty affairs and distinguished teaching professor of Industrial and Systems Engineering at NIU. 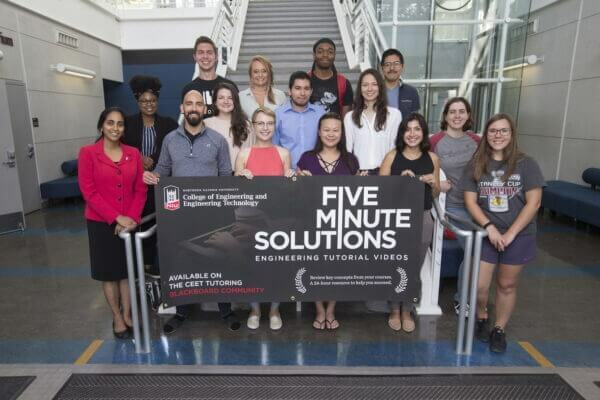 Muthuswamy’s three-pronged strategy involves the use of 5-minute Solutions—a series of short videos to help students learn complex engineering concepts, spatial visualization workshops for freshmen engineering students and a cultural sensitivity training for teaching assistants and tutors to foster an inclusive environment for students. “For learners of differing abilities or learning styles, the ability to review at a self-directed pace or to focus on particular topics has been essential for their continued success in the undergraduate program,” Muthuswamy wrote as part of the award nomination. The award aims to recognize projects that demonstrate the best use of technology to enhance diversity in engineering education. “It is truly an honor to be nominated for this global award and to make it to the Top 10,” said Muthuswamy, who created the three-pronged strategy when she served as the interim associate dean during the 2016-17 academic year. “Dr. Muthuswamy’s strategy to increase retention and narrow equity gaps in engineering, as well as her motivation and determination, aligned perfectly with the criteria of this award, especially for her impactful success in advancing scalable and technologically driven mechanisms that have led to increasing the diversity of the engineering and graduate student body,” said Donald Peterson, dean of the College of Engineering and Engineering Technology. The most recent cohort data shows 76 percent of the College of Engineering and Engineering Technology freshmen are from underserved populations. Muthuswamy took a holistic approach to increase retention and diversity in the College of Engineering and Engineering Technology. Through the three-pronged strategy, Muthuswamy aimed to help all students, regardless of gender, ethnicity or race. In doing so, the overall graduation rate will improve, she said. The strategies can be emulated to help increase diversity among the global community of engineers, a key component the Airbus GEDC Diversity Award aims to recognize. “Given the fact that equity gaps remain as a perennial and daunting challenge within higher education institutions in the U.S., Dr. Muthuswamy’s strategy serves as a solid replicable and scalable national model to increase retention and graduation rates of underrepresented students,” Peterson said.